(noun) Armor carried on the arm to intercept blows. 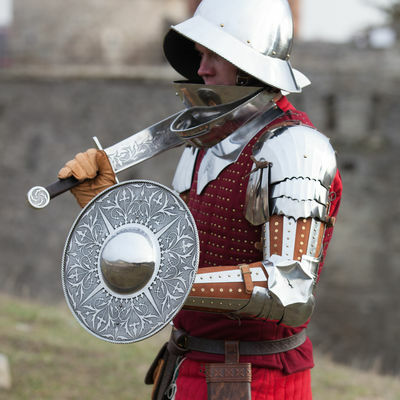 A buckler was a very small shield held in the hand, many larger shields had straps that held them in place. This is an article on swords and bucklers from the Royal Armouires collection in the UK that shows some images from a medieval manuscript. The word swashbuckler derives from the tyoe of young man who,would walk town waving their sword around in one hand with and a buckler in the other. That's a very good picture of a buckler. It is very strange that you swashed your buckle, though. Wouldn't it make more sense to swash your sword?